This is the third of a series of five projects taking place on the Black Isle in the North of Scotland. To read about the first project, click here (Groam House Museum Volunteers Group) - and for the second project, click here (Resolis Friendship Group). 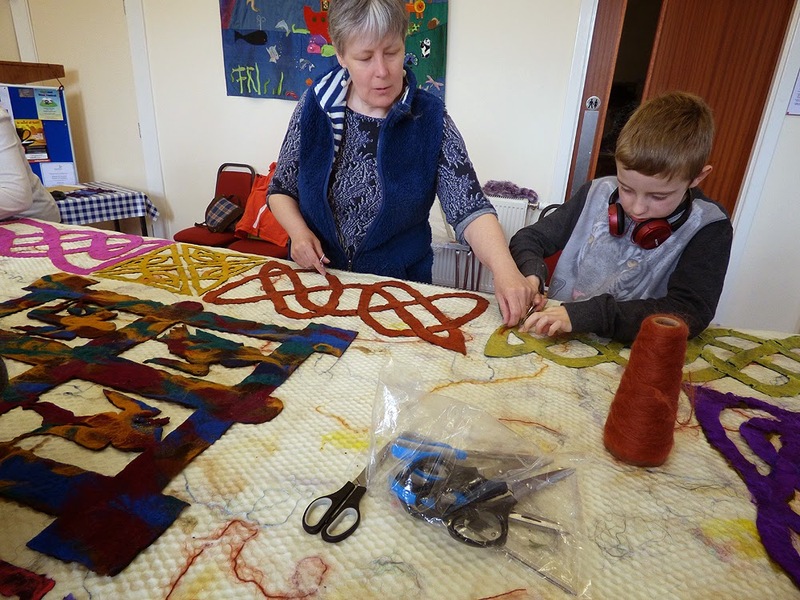 These wallhangings are being created as part of Groam House Museum's outreach programme. 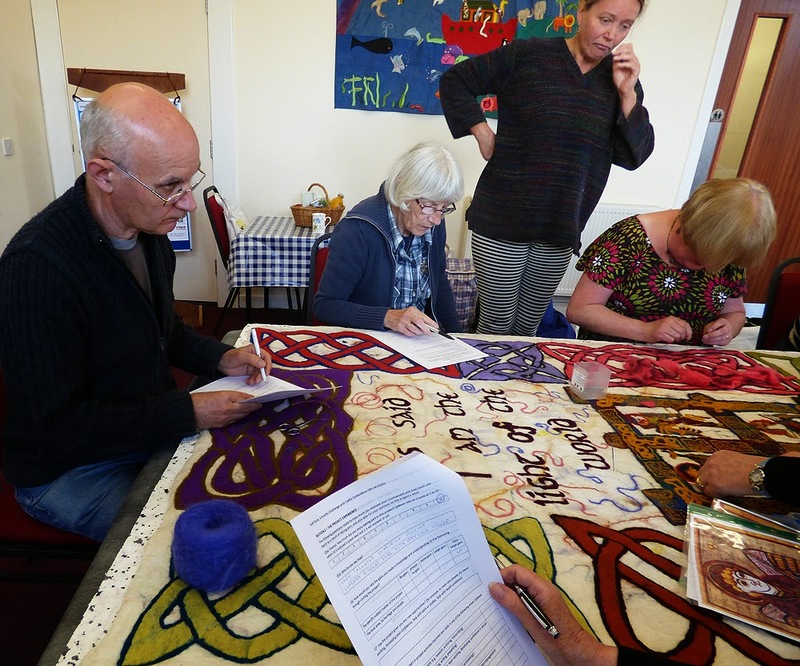 The group had had a brief introduction to the project at their monthly meeting a few days earlier, so we got straight to work. 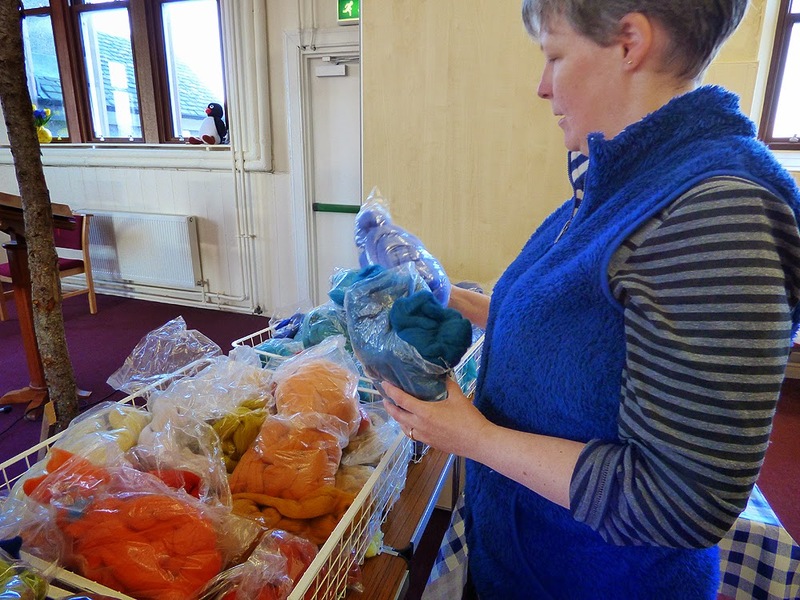 The first task was to choose some coloured fibres - dyed merino wool. 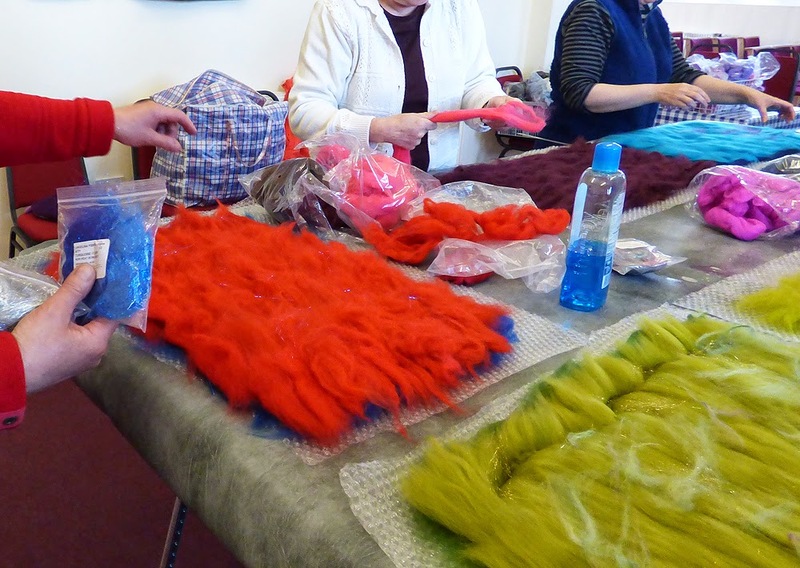 Everyone was asked to select a dark/strong colour to use as the base layer for their piece of felt. These colours were laid down on top of a sheet of bubblewrap with all the fibres running in one direction - it didn't matter which. Then everyone had to take a second colour. Some chose strongly contrasting shades of their first colour - others went for completely different hues. 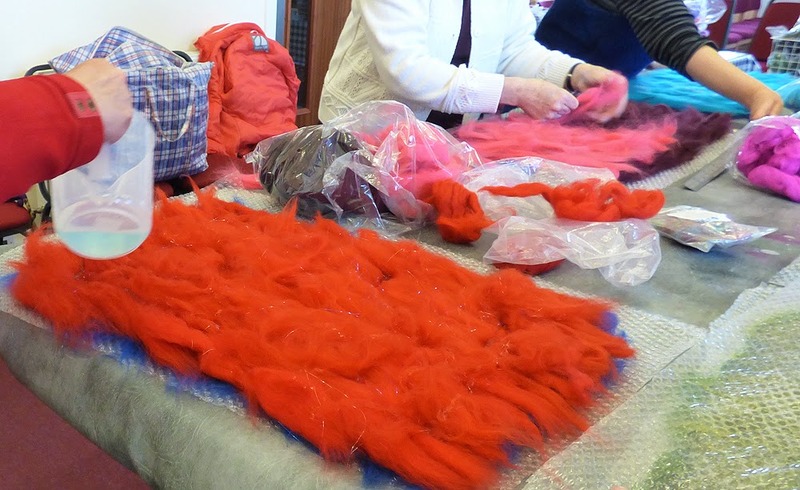 This second colour was laid down on top of the first - but with the fibres running at right angles to the first layer. 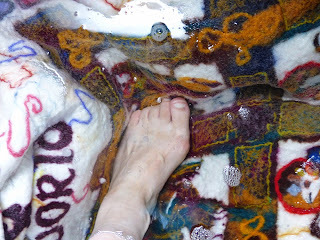 This is to assist in the felting process and make sure that there are no holes. 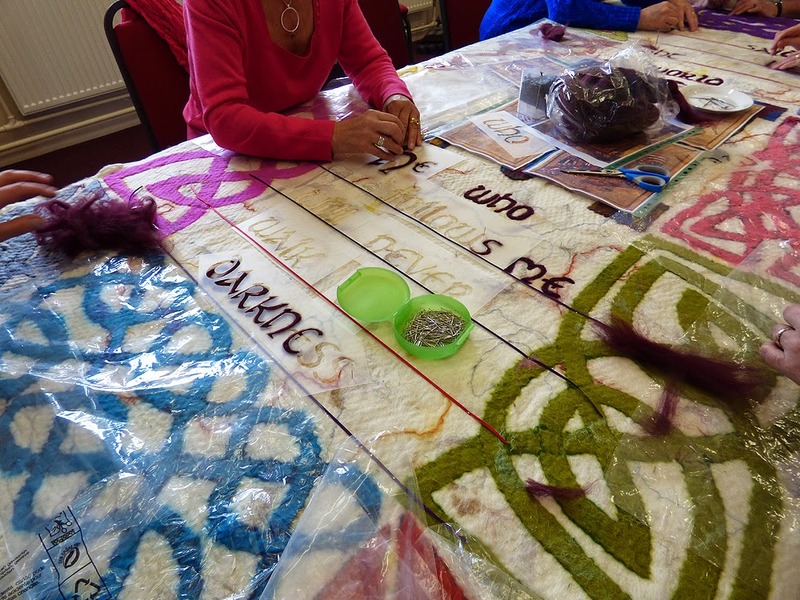 Once the two colours were in place, we added some glittery bits - mostly angelina, silk and mohair fibres. 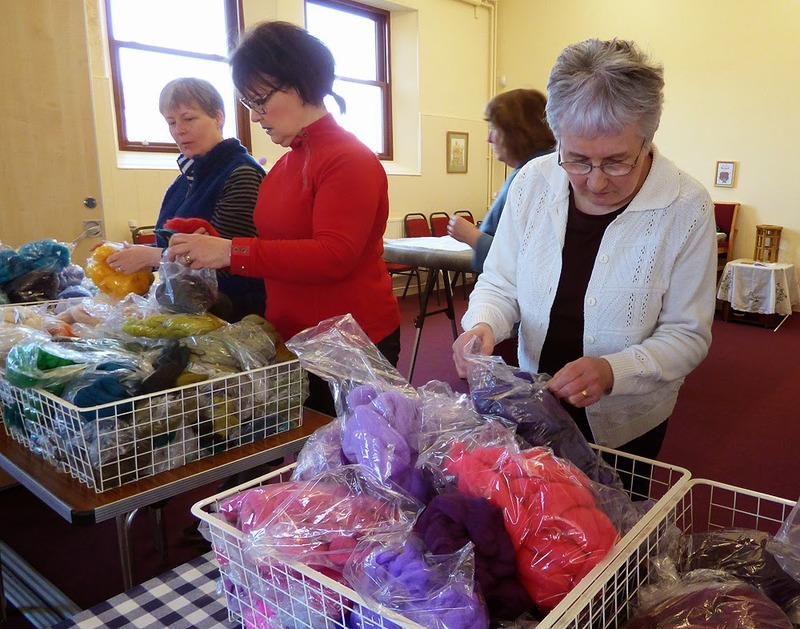 These don't felt in their own right, but get trapped by the merino wool and so are held in place. The important thing was for people to understand that for this stage - less is more! Once everything was in place, we filled jugs with hot soapy water which we then poured on top of the wool fibres. 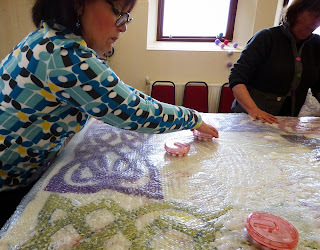 Then each piece was covered with bubblewrap and rubbed for a few minutes. 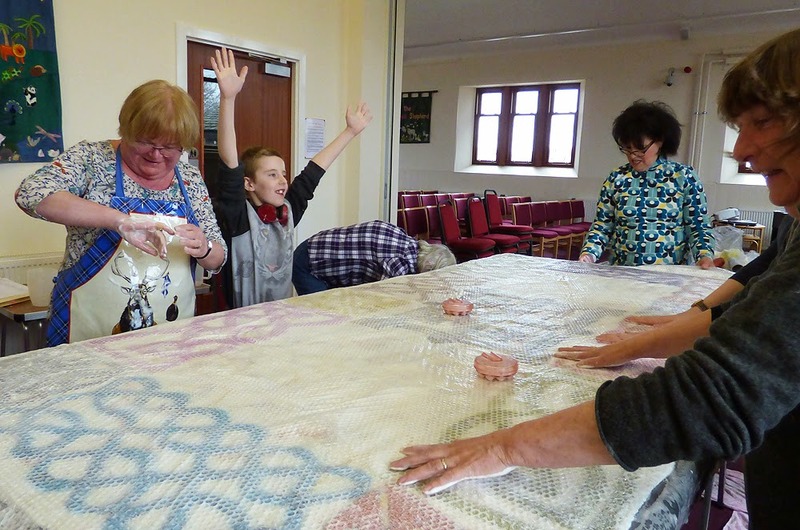 The way this works is that the soapy water is pushed in all different directions because of the bubbles in the bubblewrap and as it moves, it carries wool fibres with it, tangling them all up to make a piece of felt. It's a one-way process - it can't be undone. For this part we didn't want to fully felt - just rubbing enough to get the fibres matted together to make a piece of half felt. After a few minutes rubbing we were able to squeeze the water out and lay the pieces of felt flat ready for the next stage. Here you see Eileen testing to see how felted it was. 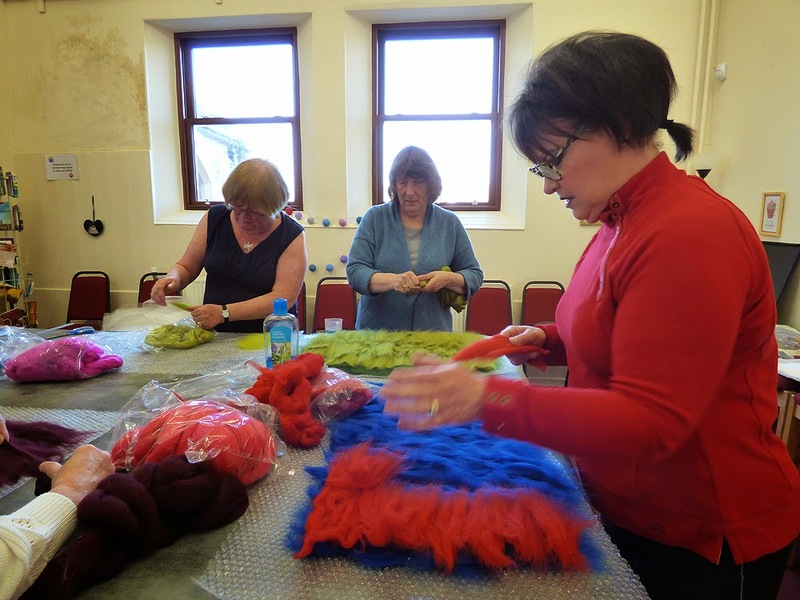 When we had the required number of pieces of coloured felt we took a lunchbreak - a beautiful sunny day so we sat outside - we lowered the felting table to sitting height and started the next task. 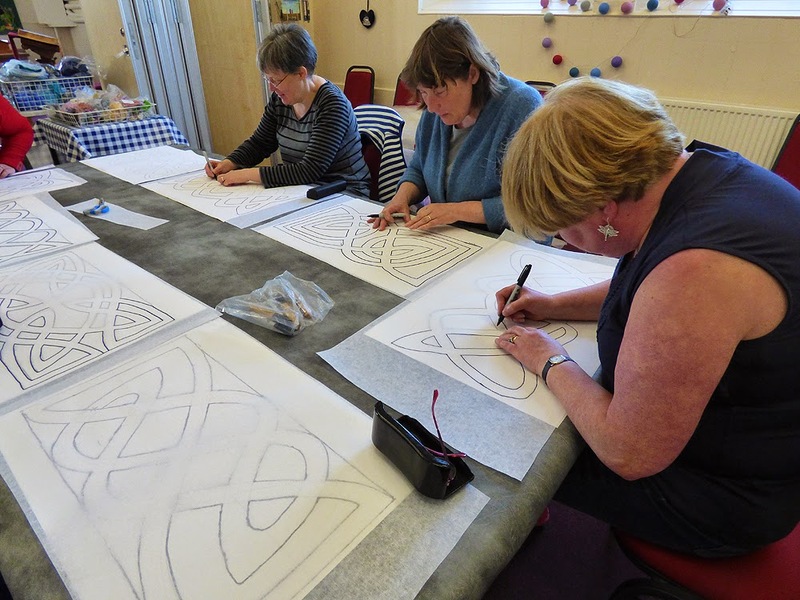 This involved tracing our Celtic knotwork designs onto a special fabric which was then pressed onto the wet felt so we could cut it out. The important thing at this stage was to not include the lines that give the "over & under" effect that is typical of Celtic knotwork. The tracing was done with spirit-based marker pens, so the ink would not run when the fabric got wet. To assist with the cutting, we marked the sections that were to be cut away. 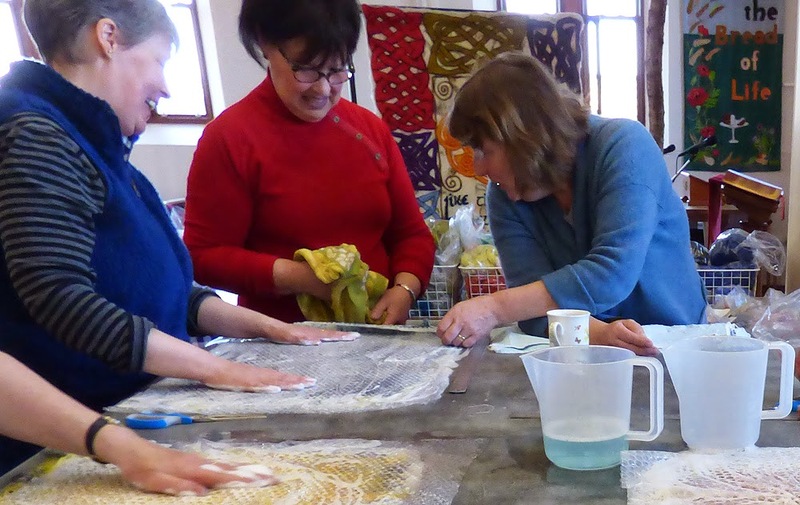 We needed 8 rectangular panels and 4 square panels to create the border for our wallhanging. When they were all cut out we spread the paper plan out on the table and started playing "put & take" with our pieces till we had an arrangement we were happy with. 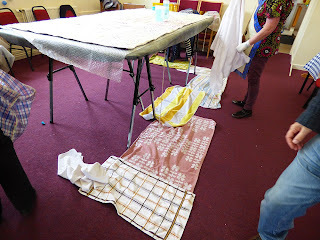 Some pieces were more fragile than others, so we kept them on pieces of bubblewrap while we slid them around. When we had our final arrangement we discussed what we would put in the central space. This involved a quick phonecall to my husband, Len, to check on a biblical reference. 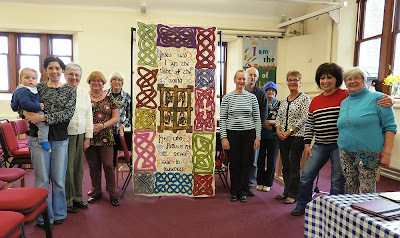 As this wallhanging is being made for a church, it was agreed we should go with something from the New Testament. The selected text comes from the Gospel of St John, chapter 8 verse 12. Jesus said "I am the light of the world. He who follows me will never walk in darkness". 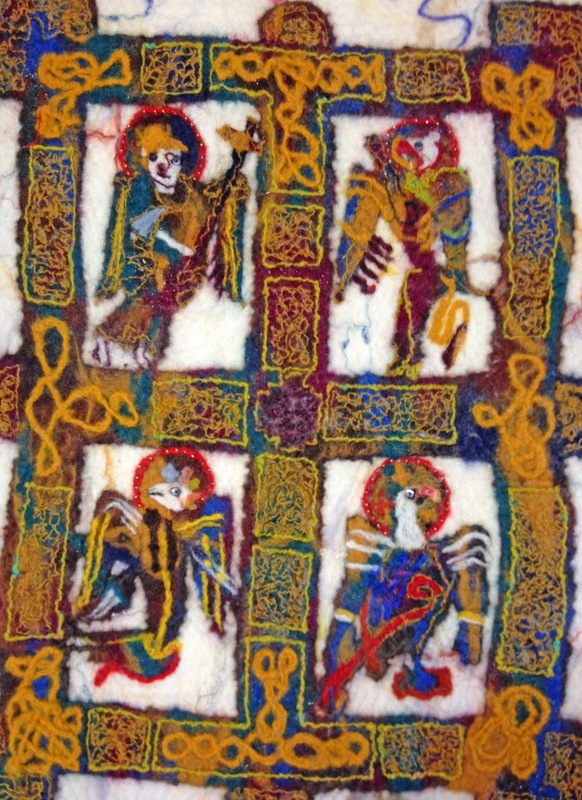 We decided we would have the first sentence at the top of the space and in the middle we would have a panel inspired by one of the Evangelists pages from the Book of Kells, with the final sentence below. 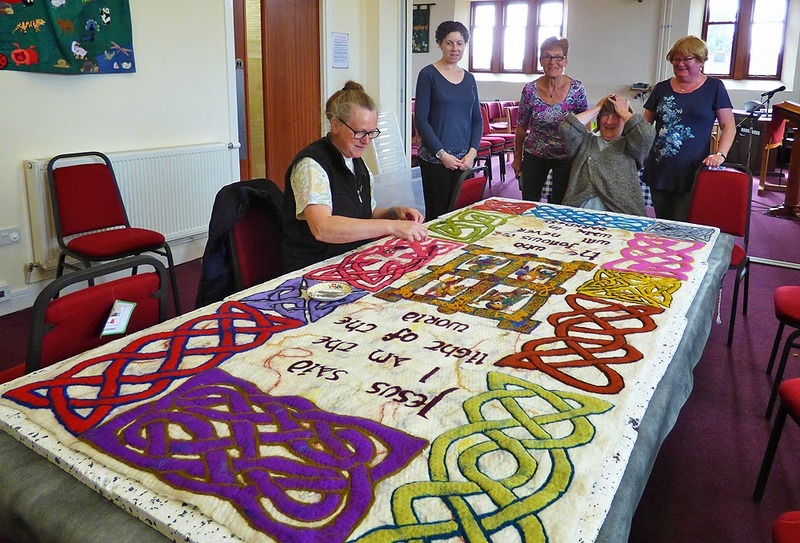 We had made good time, so a few of us gathered around the worktop in the kitchen and made another piece of felt for the central panel. All done - I had my homework to do for the next session, cutting out certal design but I was able to do this back at the studio with my laser cutting machine. A lot of work today - we had to make the main piece of felt. 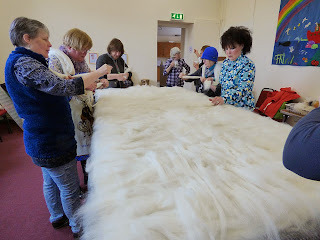 The table was set up at standing height and covered first with a sheet of bubblewrap and then a layer of ice wool on which we put the first layer of white merino wool fibres. Word had spread about this project and we had a larger turn-out today - inlcuding young Joshua who brought his mother and baby brother along to help. 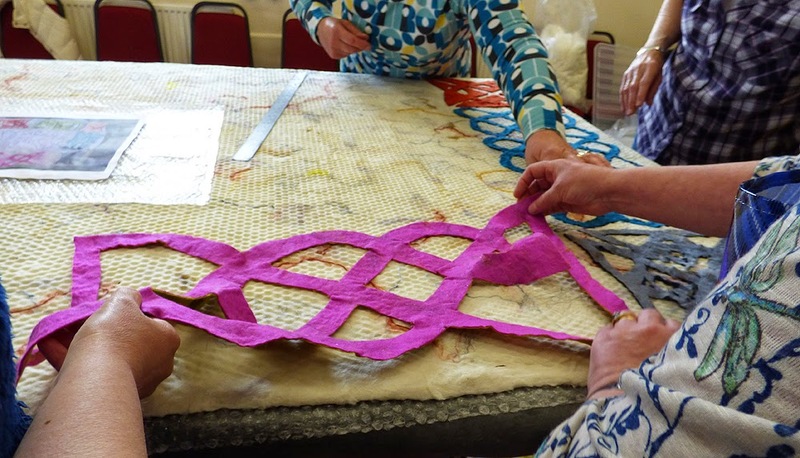 Once the first layer of fibres was in place we laid down a second layer at right angles. We followed this with a fingertip check all over for any thin patches and filled in when necessary. Then it was time for some fun bits - choosing some other fibres to add a little texture and subtle colouring to the surface. We finished this stage off with adding some very fine webs of white merino on top of the fancy bits to ensure they were trapped onto the felt. 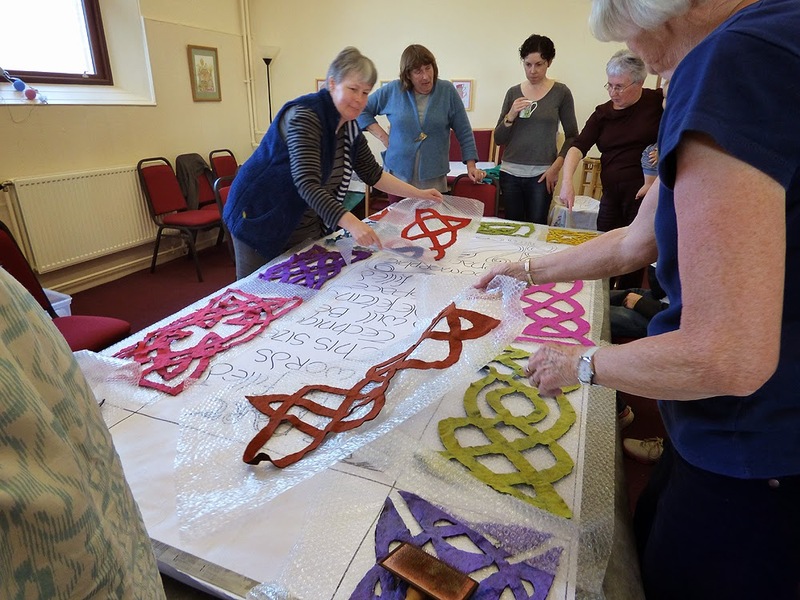 After our lunchbreak (in the sunshine) we positioned all the knotwork cut-outs we had made at the previous session, referring to the photograph we had taken. 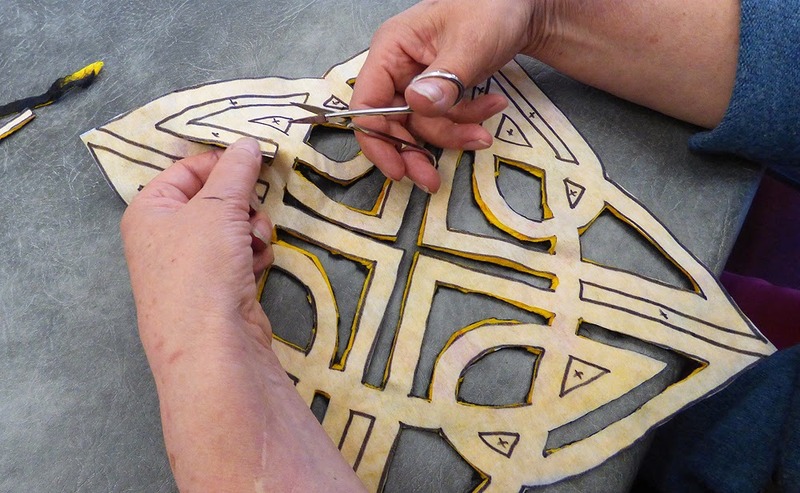 Once the cut-outs were all in place we spent some time carefully snipping through the top layer to expose the darker colour below at the intersections. This would help to give the "over & under" effect of Celtic knotwork. Here Clair is showing Joshua where to snip. Then it was a case of wetting down again, covering up with the bubblewrap and more rubbing - and rubbing - and rubbing. But then I pointed out that we had to turn the felt over and rub again from the back! 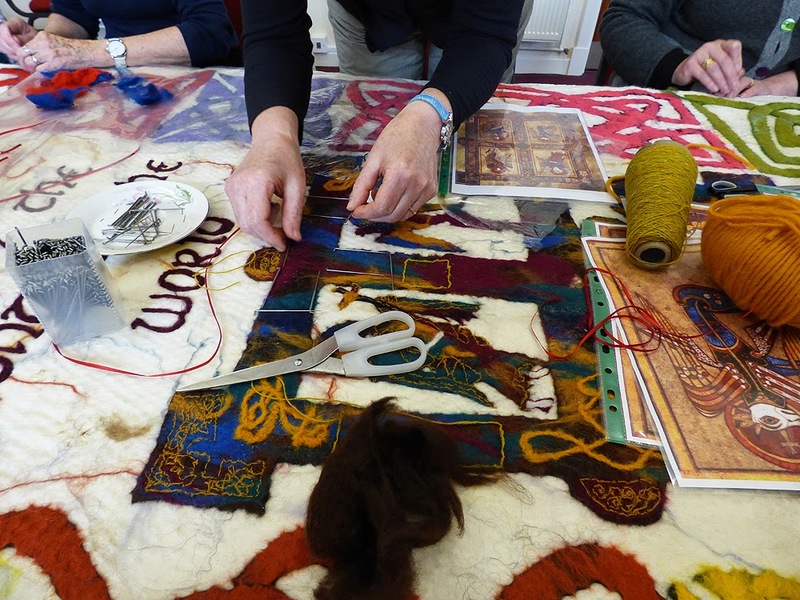 We spent the next two sessions adding the detail to our felt. 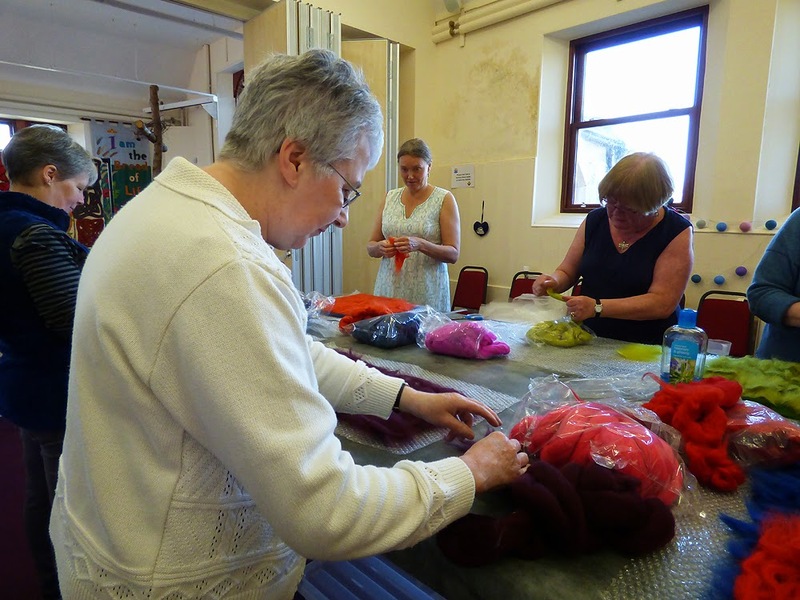 Wet felting gives a very strong fabric but the colours tend to drift in the process and accurate fine detail is difficult to achieve. 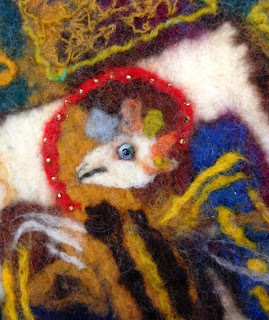 In contrast, needlefelting allows for very fine detail. So the table was set up at sitting height, covered with slabs of expanded polystyrene and then the felt. We pinned some thin ribbon to give guided lines for our text. We created the lettering by needling a dark plum coloured wool fleece through plastic stencils which I had cut back at my studio using my laser cutter. The felt was still a bit damp from the wet felting so we used pieces of polythene to keep our arms dry as we leaned on the felt. 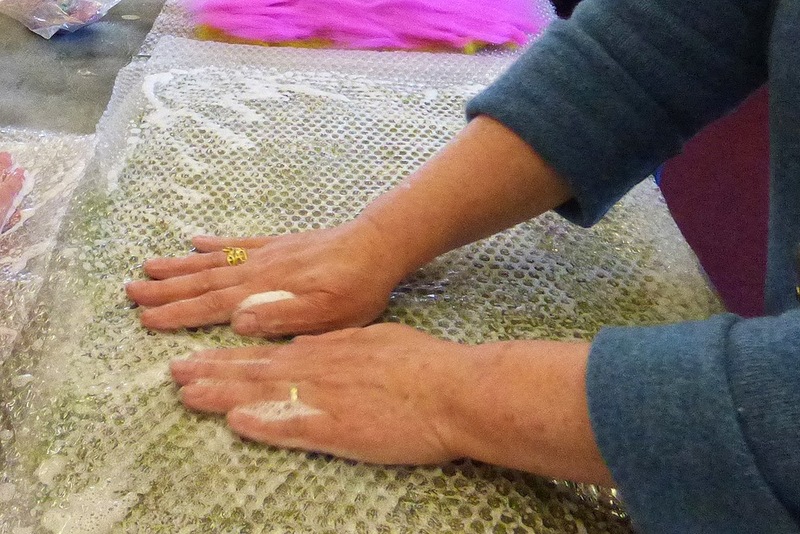 For the central section we needed fine detail so we used a selection of gold coloured wool yarns. 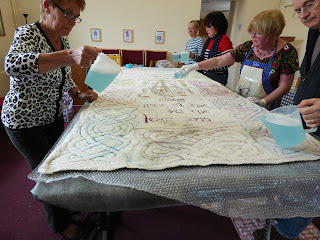 Some of our group were breaking needles rather frequently - you can see them piling up in the saucer. However, Babs found a good use for the broken parts to map out where the fine detail had to go. 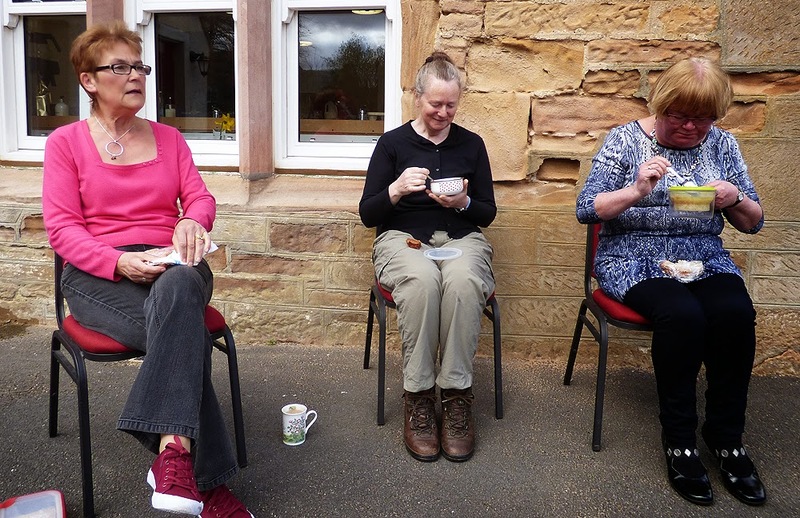 It was a lovely sunny day so after our morning of great concentration, we sat outside for our picnic lunches. 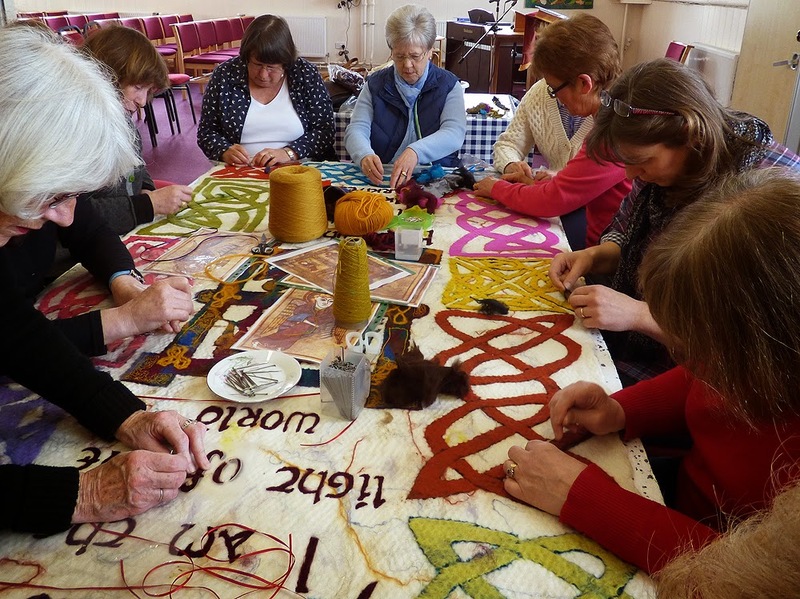 In the afternoon we were joined by several members of a local crafting group and we made good progress, the lettering was completed, the "overs & unders" were falling into place and generally we ended the day feeling very encouraged by our progress. 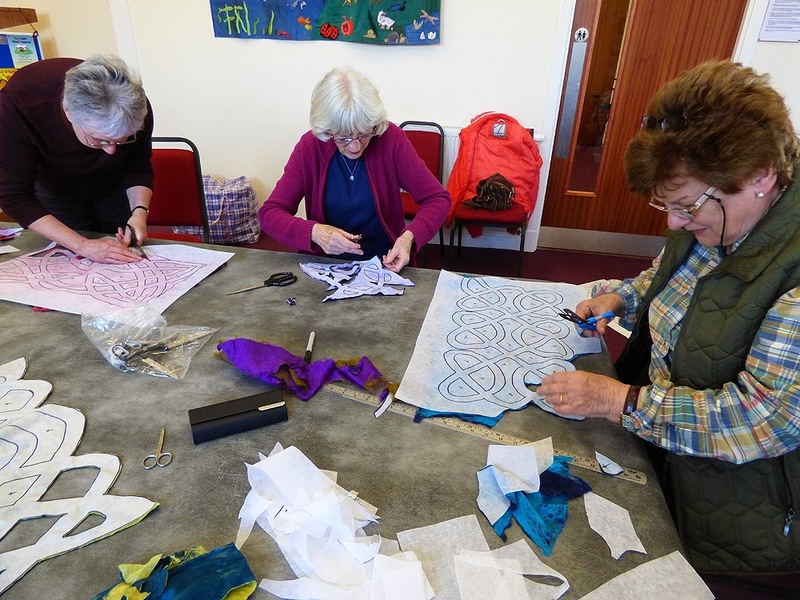 We had a week to wait for our next session - this gave us the advantage over the two previous felts in that the felt had dried out due to lovely warm weather. 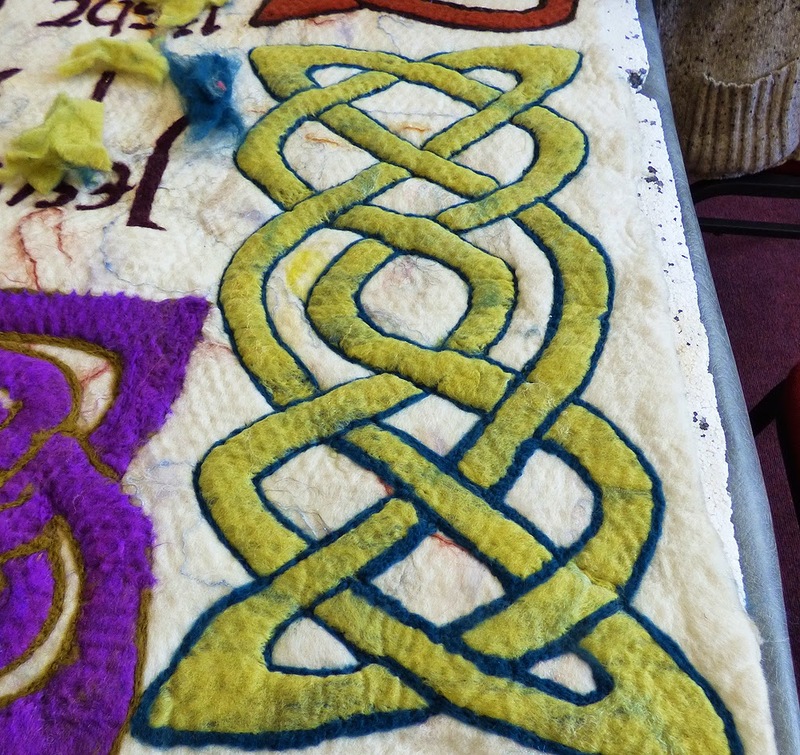 Working arround the edges of the coloured panels really brought out the detail and made the knotwork obvious. The detail in the central panel continued to grow thans to the hard work and concentration of Babs Norma and myself. 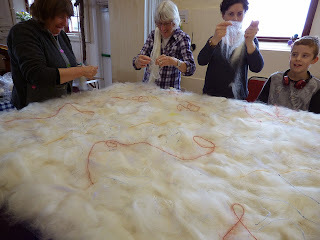 We were encouraged that by the end of the day we could see how much our efforts were enhancing the felt. 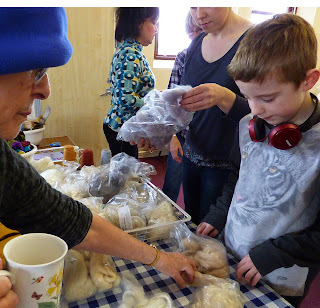 Needlefelting in this way is a rather addictive activity - Babs kept seeing another bit she wanted to finish! This was a Friday. 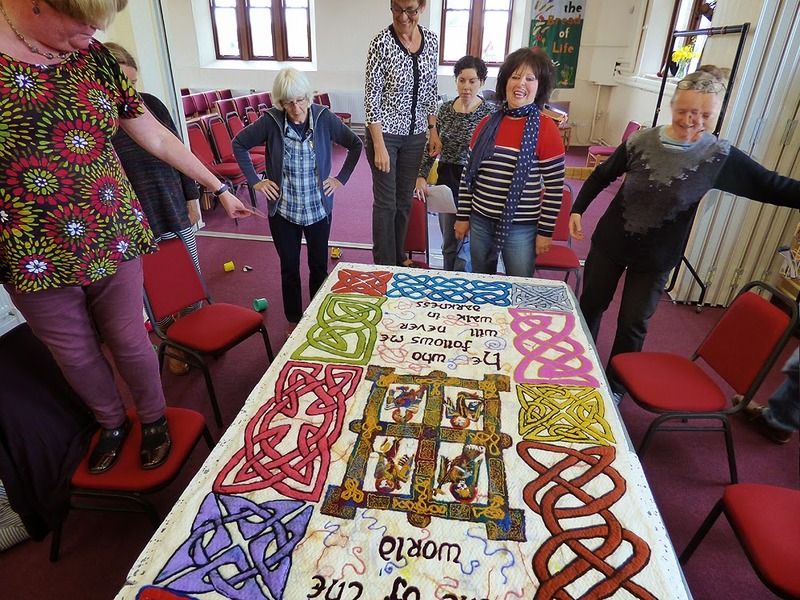 It was decided that we could leave the felt set up on the table so that when the Church was in use on the Sunday they could see how the project was progressing. 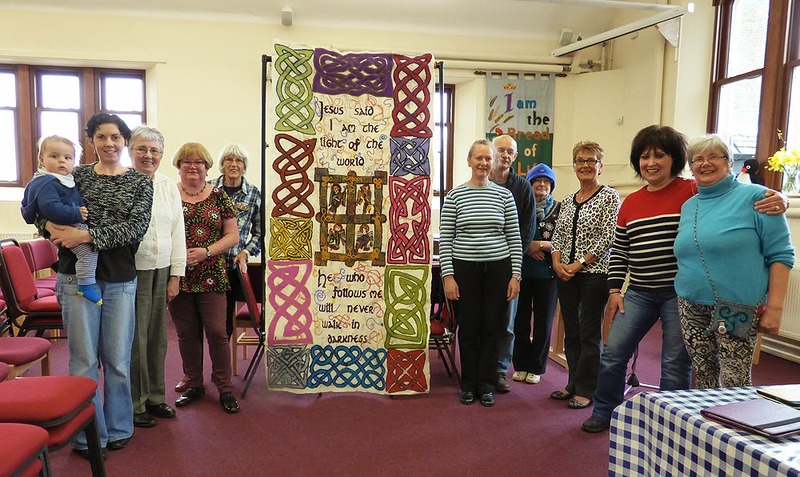 When we came back in on the Monday morning for the final session we were told that the congregation were very impressed and looking forward to the time when they could hang it up on the church wall. 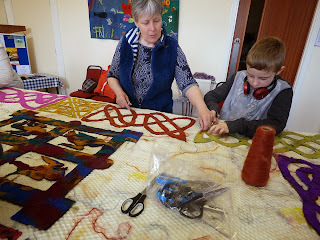 The final push - we had the morning to finish off adding the detail with needlefelting. 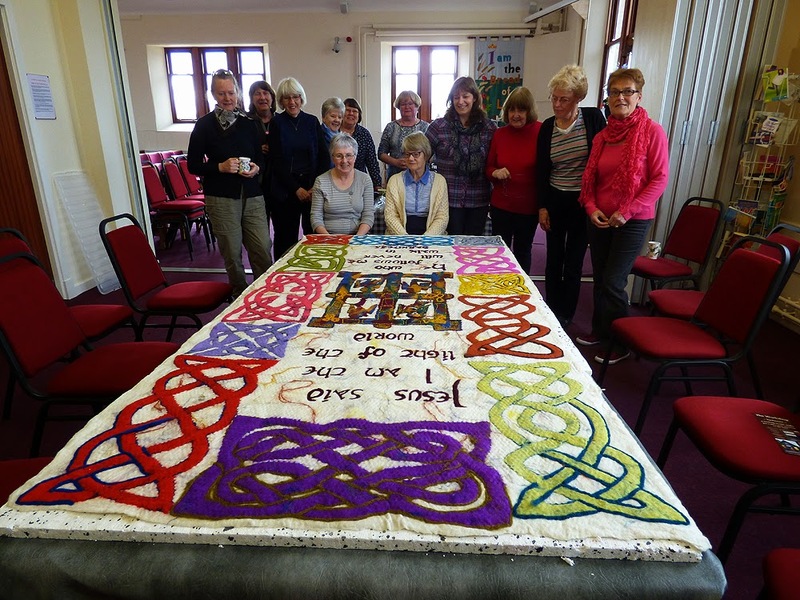 This project was made possible due to funding from the Heritage Lottery Fund. They employ an independent organisation to do detailed assessments and evaluations of some of these projects chosen at random. Wendy came in this morning with evaluation forms because our group had been selected. It took a little time out of our day, but everyone seemed happy to fill in the forms with good, positive comments. We added little twirly bits of ornament around the text. 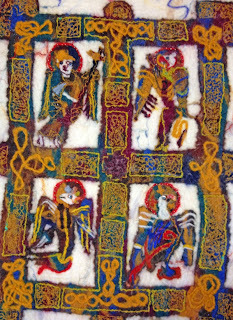 This was partly to fill in the spaces, but also to continue the theme of the Book of Kells where the scribes in centuries past had ornamented their text in such a way. By the end of the morning we were happy to stand back and admire our work - but found it best seen from above, so a few people were standing on chairs to look down on it. With all the needlefelted detail complete it was time to do a final wet felting session. This ensures that the detail is completely secure and makes the whole piece much more robust than it would be just with needlefelting. So............ table changed to standing height and covered with bubblewrap. We also put towels on the floor to protect the carpet from the inevitable drips of soapy water. It took several jugfulls of water each with a generous dollop of bubblebath and then we covered it with another sheet of bubblewrap and started rubbing. 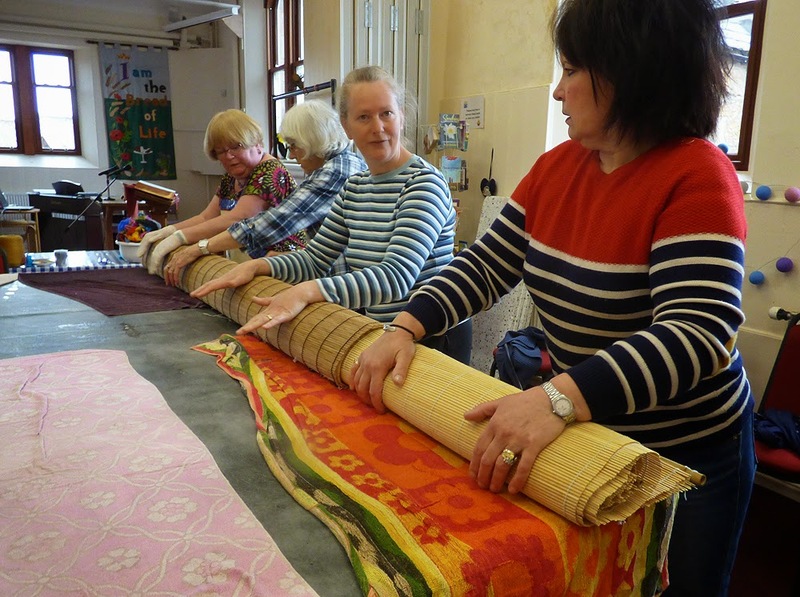 The child in each of us came to the fore at this stage and we had fun rolling the massage tools across the table! These are supposed to be used for massaging your back in the bath, but I have found them to be really useful tools for feltmaking. 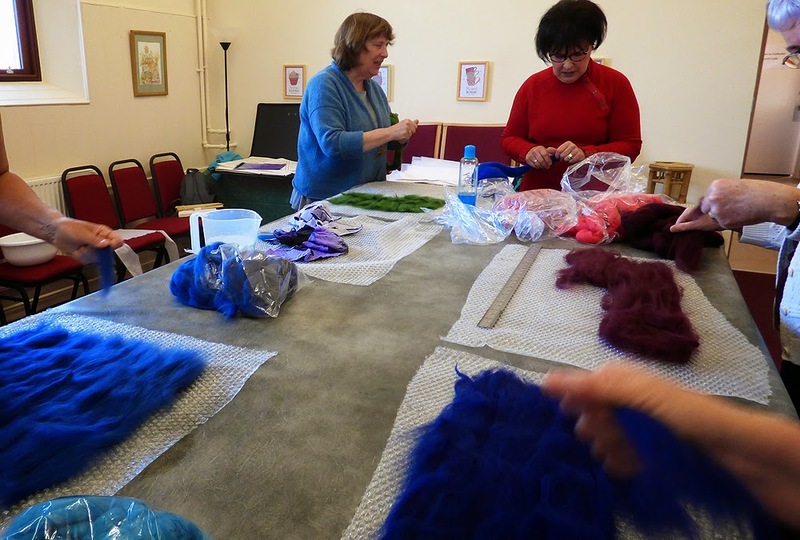 We had some discussion about what was the correct collective noun for felters - "a fun of felters"? Just a few seconds of video to give you a feel for the mood! After rubbing the back for a while we turned over the felt and repeated the proceedure on the front finishing with rub without the bubblewrap so we could be certain everything was fully attached. We rolled the felt up in bamboo mats and teams took turns to roll the bundle back and forth. 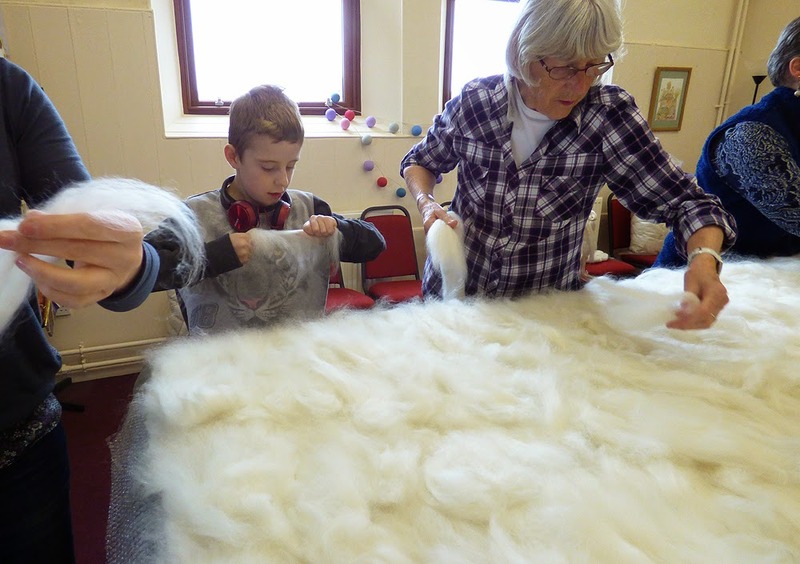 This process shrinks the felt and firms it up, squeezing out much of the water and tightening the tangled wool fibres against each other. All done............. and it was time to stand back and admire our handiwork, followed by the group photo. 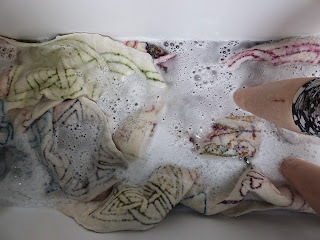 Then I had to go home and finish off....... all that soap had to be rinsed out. The size of the piece meant that the normal kitchen sink is just not big enough. It took 4 rinses of hot water in my bath, treading up and down with my feet. first rinse - lots of soapy bubbles. three bathfuls later - clear water. 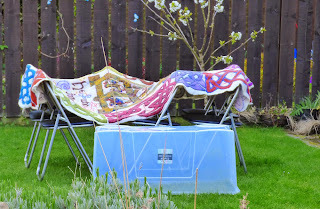 As it was lovely dry weather (though still quite cold), I could leave it outside to drip dry. Two days later it was dry. Now all that remains is for the mounting strip to be sewn onto the back so it can be hung up for display. 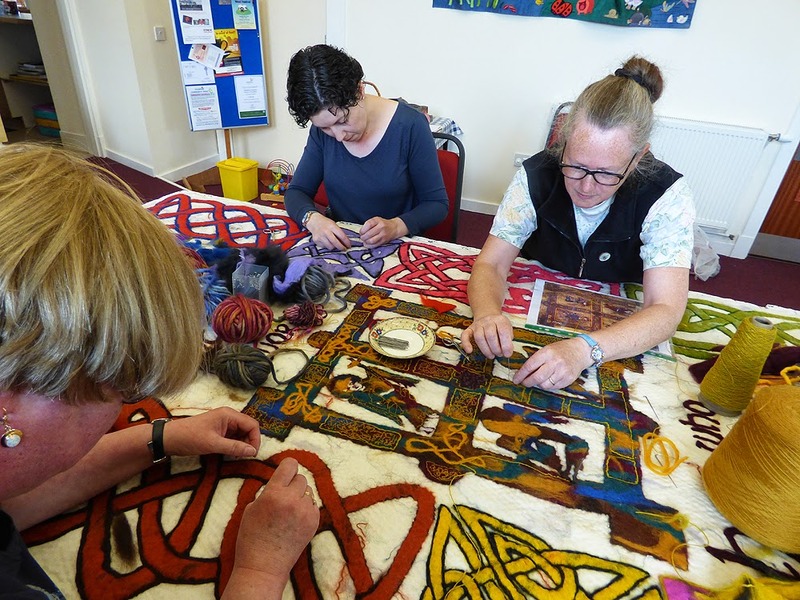 The strip to mount the felt has now been added and I also added a tiny bit of detail to the central panel - black beads and sequins to emphasise the eyes of the four Evangelist symbols in the central panels and tiny gold beads for their halos. 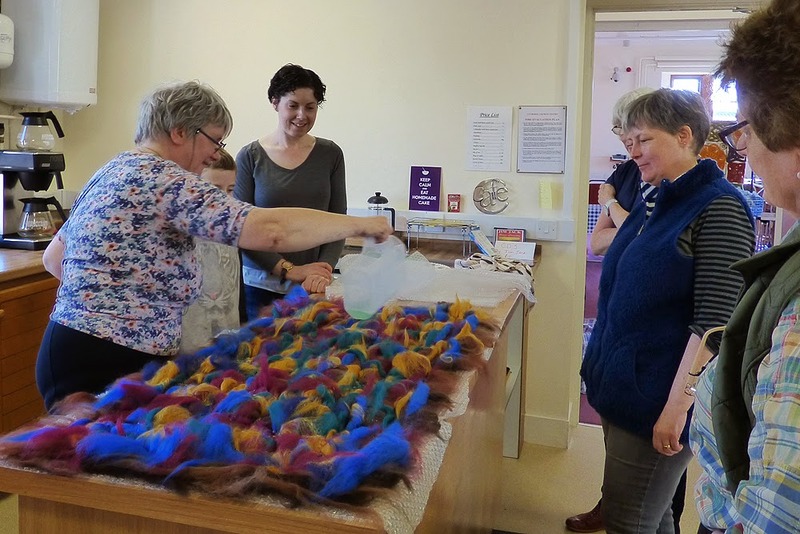 If you have enjoyed reading about this project you may want to read about the previous two projects - the felt made by Groam House Museum Volunteers and the other one made by Resolis Freindship Group - click on the names for the link. While the felt was made I took many more photographs than there was room for on this blog, but you can see more pictures by clicking here.